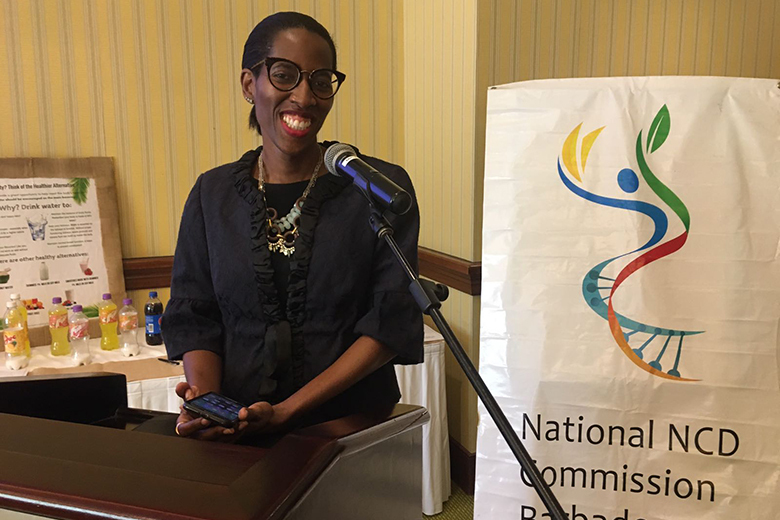 Speaking at a recent National Consultation on Healthy Foods for Barbadians, hosted by the Barbados Ministry of Health and the Barbados National NCD Commission, Karen Alleyne, Senior Marketing Manager, Massy Stores Barbados spoke about the importance of their role helping customers to reach and maintain their health goals. Supermarkets are uniquely positioned to affect the health of customers by influencing what they eat; and, as such, we should see ourselves as allies in helping customers to reach and maintain their health goals. This is of relevance in Barbados where diet-related noncommunicable diseases such as hypertension, high cholesterol and diabetes are highly prevalent. Massy Stores recognizes the potential to affect our customers in positively and we have adopted a proactive role in helping our customers navigate their food choices to achieve better eating outcomes for themselves and their families. We have sought to identify and address some of the barriers preventing customers from eating healthier meals. Recognising that two major determinants of consumption are accessibility and affordability, we have embarked on programmes to include healthier alternatives in the major product categories of the store – processed foods, snacks, chilled dairy and prepared foods to name a few. Factors affecting the prices of imported “healthy” items still need to be addressed, but thankfully in recent times we have seen an increase in locally manufactured health items which have allowed Massy Stores to increase our offering of healthy options at prices healthy for the wallet as well. Of all the categories that we have targeted, we are particularly proud of the work that we have conducted in our Produce Department, where we have increased availability and selection whilst simultaneously slashing prices. We now offer some of the lowest prices on the island for both local and imported fruits and vegetables and we continue to work with the Barbados Agricultural Society and their registered farmers to provide a conduit for their items. Because of this relationship Massy Stores has been first to market with new, innovative crops that are being grown locally. As with most things in retail Convenience is Key, so we now offer an increased selection of prepackaged, precut fruits and vegetables in our stores from precut pineapple and pumpkin to fresh fruit and vegetable salads produced daily through our Produce Departments. Our hope was that by removing some of the obstacles to healthy eating, we would see increased uptake and our project has already borne fruit. We appreciate that availability is only the first step, to truly affect change, we must educate as well. To do this, Massy Stores looks to form alliances with organizations, such as many of you present here today, with the mandate of promotion of health and wellness. As an example of this, In the near future, Massy Stores supermarkets and SuperCentre Warrens will be partnering with the Heart & Stroke Foundation of Barbados to embark on a programme of education and sampling within our stores. The objective of this programme is to is provide customers with the knowledge and know how to prepare quick, affordable and healthy meals and intercepting customers at their point of purchase to provide samples and information has been proven to affect purchasing decisions. Our hope it that it will have an effect on their long term purchasing habits as well. Another contribution that Massy Stores makes to the health of our customers comes in the form of consultation and support, provided through the Massy Stores pharmacy. Our pharmacists not only dispense medication but also offer testing and screening services to our customers allowing them to Know Their Numbers. This knowledge is vital, so starting tomorrow our pharmacy in Sargeant’s Village will offer free Blood Pressure and Blood Sugar testing every Saturday and further Massy Stores has embarked on a project with the Non-Communicable Disease Commission where a self test Blood Pressure and BMI machine will be hosted in our supermarkets. Massy Stores remains committed to improving the state of health in Barbados and we are pleased to be involved in discussions, such as these, that allow the business and health sector to formulate plans to continue to affect positive health changes.